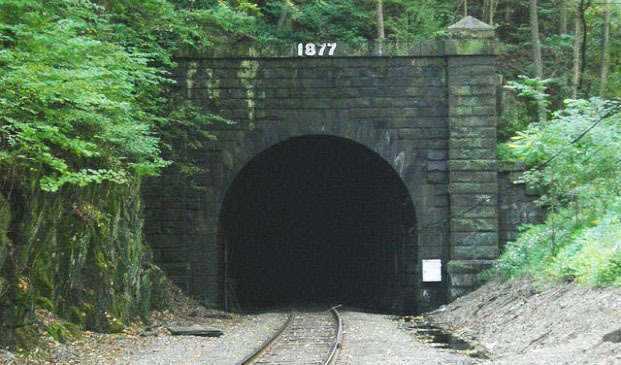 The Hoosac tunnel is 4.75 miles long and passes through the Hoosac range in western Massachusetts. Work began in 1848 and ended in 1875, with a total construction cost of $21 million. The term Hoosac itself is an old Indian word meaning "places of stones" and at the time of the tunnels completion it was the second longest train tunnel in the world and remained Americas longest until 1916 when the connaught tunnel was completed in British Columbia. The Hoosac tunnel is an ACTIVE railway and has around 30 unscheduled trains daily. It is privately owned and there are clear signs warning of trespassing. Do not enter the tunnel at any time for any reason to investigate the paranormal activity here as it may have legal or possibly fatal consiquences. The tales of the haunting at the Hoosac tunnel are quite numerous, and for good reason. Its thought that in its construction over 200 workers lost there lives. As you may expect accidents happen when undertaking huge construction projects, but this one was a little different. In 1865 nitro-glycerin was brought in to blast away the rock. This sped up the process but also the loss of lives. There are reports of a number of accidents were the charge detonated to early, or to late. On the 20th of March, 1865 a demolitions team of 3 men went to set charges to blast rock, there names were Billy Nash, Ringo Kelley and Ned Brinkman. There was an accident with the charge time however and after kelley places the charge his 2 co workers didnt have enough time to get clear and were buried under tons of falling rock. An unfortunate but expect-able accident from mining in the day, but the reason that this story is of importance is because after the accident Kelley reportedly disappeared, not to be seen until the 30th of March the next year were he was found dead in the exact spot he killed his co workers, seemingly dying from being strangled. ... the men constantly complain of hearing a man's voice cry out in agony and refuse to enter the great shaft after nightfall. Mr. Dunn has reassured them time and time again that the strange sound is nothing more than the wild winds sweeping down off the mountainside. Our work has slowed to the point where Mr. Dunn asked me to help him conduct an investigation into the matter. "Last night Mr. Dunn and I entered the great tunnel at exactly 9:00 P.M. We traveled about two miles into the shaft and then stopped to listen. As we stood there in the cold silence, we both heard what truly sounded like a man groaning out in pain. As you know, I have heard this same sound many times during the war. Yet, when we turned up the wicks on our lamps, there were no other human beings in the shaft except Mr. Dunn and myself. I'll admit I haven't been this frightened since Shiloh. Mr. Dunn agreed that it wasn't the wind we heard. Perhaps Nash or Brinkman I wonder?" There were many other unfortunate accidents during the tunnels construction, such as in 1868 on the 17th of October 13 miners were killed in a gas explosion. Shortly after one of the vertical shafts filled with water and trapped a number of workers almost 600 feet underground. It took almost a year to clear the shaft and recover the bodies, some of which appeared to have died from choking on the poisonous gasses from the digging. I would have to name almost every single paranormal experience you could possibly have to list the various spooky encounters people have had in and around the tunnel. Many of the nearby towns folk reported peaks of paranormal activity whenever a major accident occurred and common tales from the area reported everything from the apparitions of the workers to full manifestations in their homes. The tunnel itself is were the most activity happens. Everything from strange uneasy feelings and nausea to full apparitions of workers and eerie screams and whispers in the dark. The sounds of footsteps from empty areas and rubble moving are amongst the most common encounters, but it seems everyone has their own creepy experience of this place.